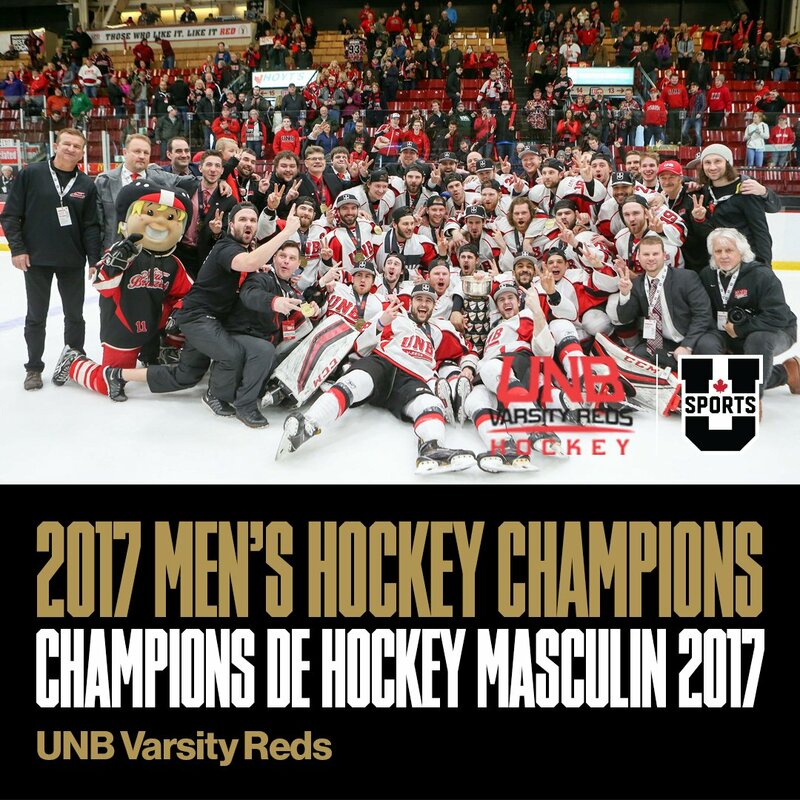 The University of New Brunswick Varsity Reds successfully defended their National Championship and captured the 7th title in school history with a 5-3 victory over the Saskatchewan Huskies before a raucous sold-out AUC crowd this afternoon. Cam Braes paced the offense with four goals in his final university game to give the V-Reds back to back championships for the first time in program history. - When asked how they were going to beat Goaltender of the Year Jordon Cooke, head coach Gardiner MacDougall said they would have to get "to the blue paint" and that is exactly what they did to score the game's opening goal 4:04 into the first period. Christopher Clapperton carried the puck into the Huskies zone and made a nice move to get around the defenceman to get the puck on net. Cooke couldn't control the rebound and the puck laid in the crease during a goal-mouth scramble before Cam Braes got a stick on it and slid it under the Huskies goaltender, who was down in his back. Philippe Maillet and Clapperton picked up the assists on the goal. - The Huskies responded at 10:47 to tie the game and quiet the sold-out crowd. Connor Gay took the puck the length of the ice before letting go a wrist shot from a sharp angle near the right wing hash marks that seemed to handcuff Etienne Marcoux and sneak in for an unassisted goal. - Just like they did on Thursday day when Queen's opened the scoring, the Varsity Reds struck back in a hurry and it was another "ugly" goal off of a scramble in front of the Huskies net. Matt Petgrave brought the puck deep into the Huskies zone and found Philippe Halley trailing the play, coming down the slot untouched. Halley's shot went wide, but the puck bounced hard off the end boards and back out near the side of the net where Mark Simpson was able to whack it off Cooke's left pad and into the corner of the net. The marker restored UNB's lead at 12:19 of the opening period - just 92 seconds after the Huskies netted the tying goal. - UNB would take a 2-1 lead into the dressing room after a period in which Saskatchewan held an 11-8 shot advantage. - The Varsity Reds looked to be well on their way to an easy win early in the second period when they scored a pair of quick goals to build a 4-1 advantage. At 3:17 Cam Braes got his second of the game when he finished off a tic (Clapperton) - tac (Maillet) - toe passing play on a three-on-two rush by redirected the puck past Cooke from the top of the crease to give UNB a two goal lead. Just under three minutes later Braes (Maillet, Mignardi) struck again, this time only 7 seconds into their first power play of the game to complete his hat-trick. The puck was worked down low to Braes at the side of the net and after grabbing his own rebound he was able to sneak the puck between Cooke, and the post from a tough angle on his second attempt to make it 4-1 and send a shower of hats to the ice. - The Huskies quickly responded with a power play goal of their own to bring it back within two goals when defenceman Jordan Fransoo's (Gay, A. Johnson) wrist shot from the high slot found its way through traffic in front and beat Marcoux blocker side. - There would be no more scoring in the period, despite the Varsity Reds dominating possession during the latter half of the period and forcing Cooke to make a number of larcenous saves, including one in which he had to reach back and pull the puck off the goal line after it trickled through him. Shots in the period were 21-5 for UNB. - Things became tense for everyone in attendance early in the 3rd period as the Huskies narrowed the lead to 4-3 with their second power play goal of the game at 4:17. After Randy Gazzola and Rob Mignardi took penalties 31 seconds apart the V-Reds penalty killing was put to the test. They managed to kill off the 5-on-3, but with 16 seconds remaining in the second penalty Kohl Bauml (Gay, McVeigh) shoveled the puck in from the side of the net to make it a one goal game. - Once again, the Varsity Reds had an answer. The Huskies took a penalty at 8:33 and 17 seconds later Cam Braes notched his fourth goal of the game with a slick spinning backhand to forehand move to work from the side of the net to the front of the net before putting the puck into the far corner to restore the two goal lead. Assists on the goal went to Maillet - his 4th of the game - and Jordan Murray. - After the goal the UNB clamped down and limited Saskatchewan to few scoring chances, perhaps the biggest ones being a toe save from in tight on Logan McVeigh with just over 7 minutes remaining and then on a scramble off of a Huskies rush with 5 minutes left. The Huskies pulled Cooke with 1:33 but weren't able to generate anything dangerous as the time ran out on the game, and their season, giving the hometown Varsity Reds their second consecutive championship - and 7th overall. - Shots in the 3rd period were 7-5 for UNB, who held a 36-21 advantage in the game. The V-Reds really tightened up defensively after allowing nine shots on goal in the first ten or so minutes of the game. - Saskatchewan went 2 for 5 on the power play. The V-Reds went 2 for 3. - Etienne Marcoux made 18 saves to improve to 6-0 all-time at the University Cup. This was the first time he allowed more than one goal in a game. - Attendance was 3374. One lucky fan walked away with the biggest 50/50 jackpot in AUC history at more than $8600. - Braes (4 goals) and Connor Gay (1 goal, 2 assists) were named the player's of the game. - The V-Reds once again dominated the face-off circle, winning 46 out of 74 draws. Mark Simpson led the way with 15 wins in 21 chances while Braes (11 out of 16) and Dylan Willick (10 out of 18) also had big nights at the dot. - Philippe Maillet was awarded the Major W.J. 'Danny' McLeod Award as the University Cup MVP. Maillet had 4 goals and 6 assists in the tournament. His 17 career points (5 goals, 12 assists) in 9 games at the University Cup is now a school record. - Although his scoring prowess is obviously well documented, it should be noted that Maillet came up with a huge blocked shot in the final minute of regulation time to help kill valuable time off the clock. It's things like that which makes him the Player of the Year and one of the leaders on this year's squad. - With his 1st period assist on Mark Simpson's goal, Philippe Halley moves into 2nd place in UNB history with 14 career University Cup points. - Cam Braes 9 career University Cup goals are only behind Halley's 11. His four goals today ties a tournament record and is the second time he has accomplished the feat, having also done it against Windsor in 2015. 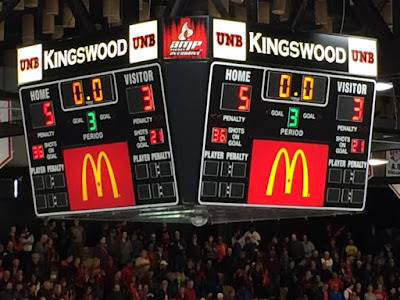 - UNB has received a hat-trick in 6 out of their last 9 University Cup games. - Braes and Cameron Critchlow each finish their UNB careers with 3 national championships, joining Josh Hepditch and Lachlan MacIntosh (2007, 2009, 2011) and Travis Fullerton, Dion Campbell, and Daine Todd (2009, 2011, 2013) in the exclusive club. - Rob Mignardi will also cap his 5th year with a national championship. - Joining Maillet on the all-tournament team were Marcoux (G), Acadia's Geoffrey Schemitsch (D), Saskatchewan's Jesse Forsberg (D), Braes (F), and Saskatchewan's Levi Cable (F). - UNB becomes the first host team to win since they also did it in 2011. Those are the only two instances since Alberta went 2 for 2 in 2004 and 2005. - Saskatchewan falls to 1-6 all-time in title games. - Over at his Twitter, Victor Findlay has post-game reaction from Gardiner MacDougall, Francis Beauvillier, Marcus McIvor, Stephen Anderson, and Randy Gazzola. 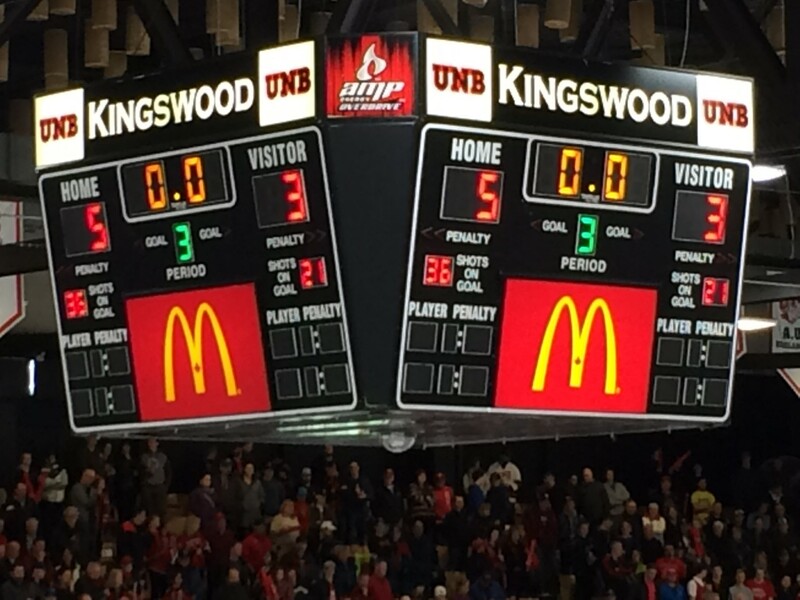 - UNB finishes the season with a record of 35-7-3 (35-5-3 against CIS competition). This includes a 4-2-0 exhibition record, 25-2-3 conference record, 3-3 playoff record, and 3-0 University Cup record. It is the 9th time in 10 seasons they have won at least 34 total games. - They went 23-1-0 at the AUC this year. - In the bronze medal game played this morning Acadia defeated St. FX 6-3. - The Varsity Reds are back in action....in September.